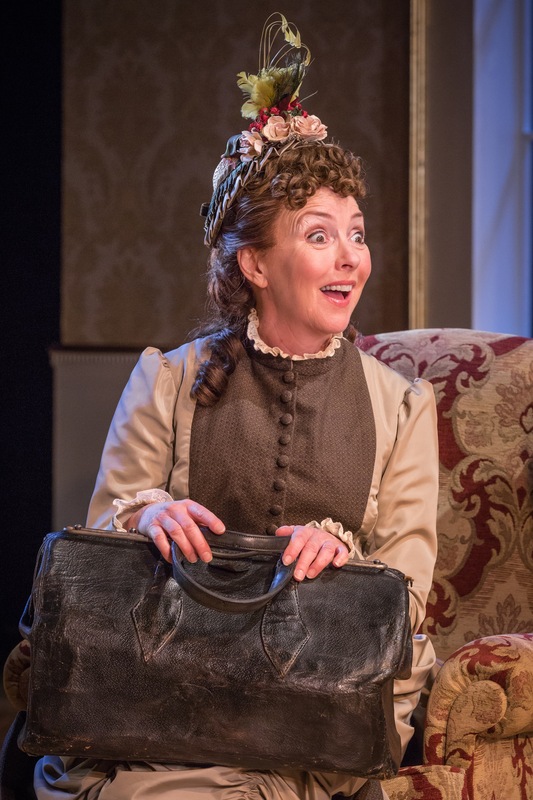 We Are Chester’s James Wright heads over to Theatr Clwyd in Mold to check out their latest production – Oscar Wilde classic The Importance of Being Earnest. Photos courtesy of Marc Brenner. Where on Earth do I start? Mold’s Theatr Clwyd has brought Oscar Wilde’s The Importance of Being Earnest to life, and I have the opportunity to live every second of it. From start to finish, the performance has me in stitches, as well as the rest of the auditorium. There is definitely something to be said for this made in Mold production, so let’s do so, shall we? Firstly, I must inform you all that if you intend to go to Theatr Clwyd for a matinee for this piece, or any for any reason whatsoever, they are now operating a pay and display system in their car parks. The cut-off for paying, I believe, is 5pm onwards, just in case you fancied a midday excursion to the (Oscar) wilds of North Wales (I am so sorry, that’s the best I could do). Anyway, the first thing we notice when we take to our seats in the Anthony Hopkins Theatre – which are at the peak viewing position (seats H19/20/21 if you’re interested) – is how initially unassuming the stage was. The first act of three plays out in the office room of Algernon Moncrieff (played by one of my two favourites of the night James Backway). Here, we see Algernon and his friend Jack Worthing (played by Matt Jessup, the other of my two favourite actors of the night) discuss such frivolous things as marriage, and Algernon’s cynical views on all things of that nature before attention is drawn to a mysterious cigarette case of Jack’s that was left behind at a previous house party. 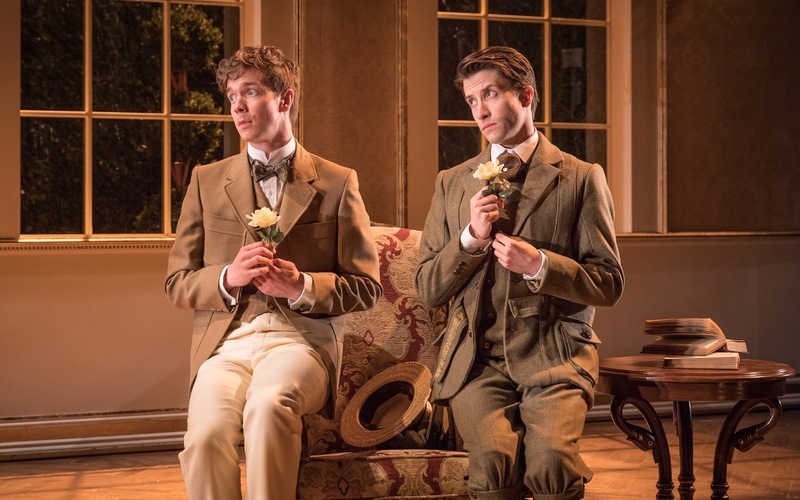 Whilst Algernon knows Jack as Earnest, it appears he lives a double life whilst in the country, which sets up some monumentally funny moments in the second and third acts. Jack is not alone in his secrecy, however, as it appears Algernon enjoys spending time with an “invalid friend” named Bunbury – time conveniently spent when Algernon would otherwise be in the company of family or other such people whose company he cannot stand. From here, we see the emergence of Lady Bracknell (played by Hilary Maclean of Torchwood, Casualty, and ITV’s Arthur and George mini-series fame). She just so happens to be Algernon’s aunt as well as the mother to Emma Denly’s Gwendolen, whom Jack/Earnest intends to marry. The big problem here though is that Gwendolen does not know that Jack is really Earnest. More shenanigans play out, as you can imagine. The first act draws to a close, and amidst the beautiful classical music that accompanies much of the performance, the segue between acts is interrupted by jazzed-up covers of some of the best pieces, which I thoroughly enjoy. For instance, between act two and three, Wagner’s Ride of the Valkyries plays out but with an almost drum and bass remix to it. Strangely enough, it really works. I just wish I knew where to get a copy, I’d make that my alarm tune in the mornings. The second half plays out in the courtyard of the Manor House of one Jack Worthing. Here we meet young Cecily (played this time around by the lovely Robyn Cara) along with her governess Miss Prism (played by Melanie Walters, whom fans of the BBC comedy Gavin and Stacey will recognise as Stacey’s mum Gwen West). Cecily tries studying in the gardens until Earnest – actually Algernon – comes along. Cecily grows particularly fond of her Uncle Jack’s estranged brother Earnest, and apparently gets engaged to him on 14 February, a whole three months before she meets him. Earnest leaves and Jack arrives with the grave news that his brother Earnest has died as per the plot device that Jack and Algernon cooked up in act one. Imagine his surprise then, when Jack’s friend comes along and introduces himself as Earnest. Oh, my! The whole play becomes a case of double identity and hilarity as the pair of Earnests realise that their beloved partners are quite in love with them, as long as their name is Earnest. Anything else would be without interest for both Gwendolen and Cecily. What are two hopeless and apparently luckless boys to do but to get themselves Christened then? The third and final act plays out in the morning room of Jack’s Manor House, where we see the culmination of the previous two acts come together. Cecily and her Earnest (Algernon) and Gwendolen and her Earnest (Jack) can finally become engaged as all is well between them again. That is until Lady Bracknell reappears to give her disapproval and judgement over proceedings. Miss Prism returns and the two women have a meeting about a certain incident that occurred 28 years ago. I won’t give things away more so than I already have, but let’s just say that everything falls into place nicely for everyone on stage, apart from maybe the butler Merriman (played by the outstandingly funny master of comedic timing Nick Harris). Having never read the book, or seen any of the movie adaptations, I know very little of what to expect coming into Theatr Clwyd. Upon leaving, however, I find myself laughing well after the acts have finished and the actors have left the stage. The amount of physical comedy on display, especially from Nick Harris, is amazing, and the facial expressions and mannerisms of James Backway and Matt Jessup make the whole performance just that little bit better. The whole thing, from the set to the costumes,is excellent. The score is lovely and soothing (and then frantic and energetic during the segue into the next act), and the acting is top-notch. James Backway, Robyn Cara, Emma Denly, Nick Harris, and the director Richard Fitch may have been making their debut in Theatr Clwyd with this performance, but I think I can say on behalf of the audience at the theatre, they are welcome back any time they please. The Importance of Being Earnest is designed by Lee Newby and directed by the Sir Paul McCartney Human Spirit Award-winner and Liverpool Institute of Performing Arts graduate Richard Fitch, who is making his debut here. 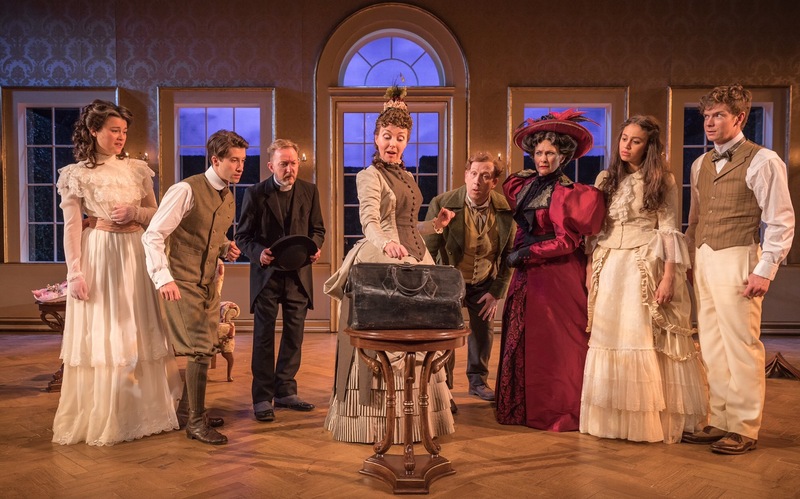 The Importance of Being Earnest runs at Theatr Clwyd until 27 May, with matinees on a Saturday and on Wed 17 May and Thursday 25 May. Tickets are available online here or by calling 01244 701521.